If you are looking for a beach front property then look no further! This beautiful freshly remodeled 2 bedroom cottage sits directly on the beach - out the back door and into the water. Wonderful rear deck with soft seating overlooks the private sandy beach and Long Island. The cottage has been completely re-done inside and out. Everything is new! Free Internet Wi Fi, Cable TV, AC. Completely furnished. All you need to bring is linens. Bring your Jet Ski, Boat and use our moorings! 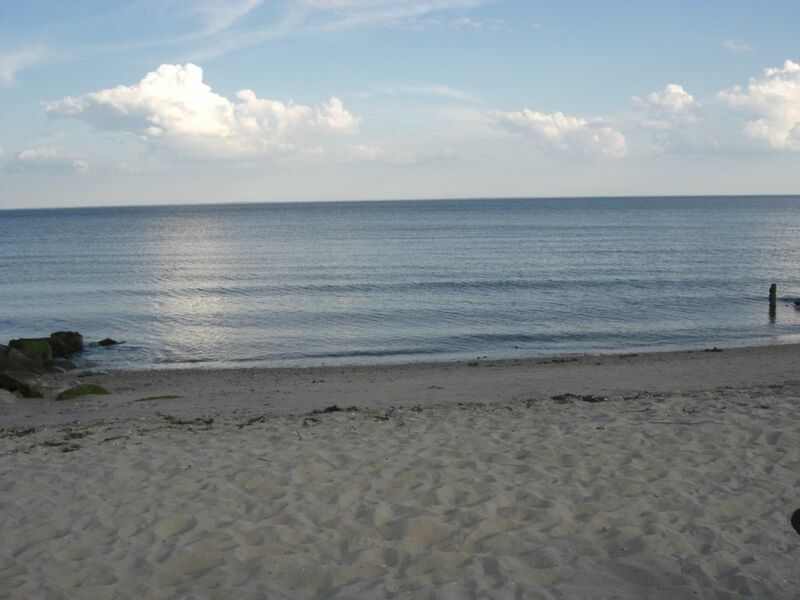 Take a look at our other 2 BR beach front cottage in Clinton, CT Property # 202814 next to this cottage. Free internet Wi Fi, Cable TV, AC. Couldn’t get closer to the beach. Lovely to hear the waves from every room. Karl was readily available to answer any questions. Fantastic deck perched high above sand looking out over LI Sound. Cute as a button! We had such a great week in the Viola Cottage enjoying the beach, the fishing, and the great surrounding restaurants. The cottage is nicely furnished and everyone slept well with the sound of the water. This is a definite return vacation. Owners were very pleasant. Alice P.
My sister and I and our two sons had a wonderful time here. The kids loved playing on the beach and it was perfect being able to sit on the balcony with our coffee and watch them. The cottage had all the amenities we needed to have a comfortable stay. We enjoyed Lobster Rolls from Lobster Landing (ordered out and brought them back to the beach house), perfect! The location is great, One day we walked through downtown Mystic (just a half hour away) and ate at Mystic Pizza and another day we drove into New Haven (again just a half hour drive) and toured Yale. On top of that Clinton had all the shops we needed. Most of the time though we stayed in the cottage or on the beach, the weather was lovely and the beach house was bright and comfy. We would definitely stay here again and recommend it to anyone. This is a wonderful property! House is perfectly maintained and decorated! The location is close to everything and yet right on the water. Couldn't have been happier for our mom's get away. Thank you Karl for a perfect weekend. Great place! Am planning to book again. Very nice cottage, all amenities included except washer/dryer which would have been a benefit to those coming fromout of state. Clinton is a wonderful Classic New England town. This beach front community has plenty to offer. Enjoy Long Island sound at your backdoor, or make your way into town for some of the best sea food you will ever have! Movies, outlet shopping, theater, Restaurants, and much much more are just around the corner, or stay at the beach and have fun in the sun. Cash, Check or Credit Card Credit Card Number Needed for Security Deposit Please see owner for property rates.